Praia de Alvor is a popular beach in the town of Alvor. This former fishing village transformed into a lively tourist destination, with many restaurants and bars. Near Alvor beach you can find a long boardwalk, that takes you through the beautiful Ria de Alvor Nature Reserve. Watch the following video to get an idea of the town of Alvor and the beautiful beach of Praia de Alvor. 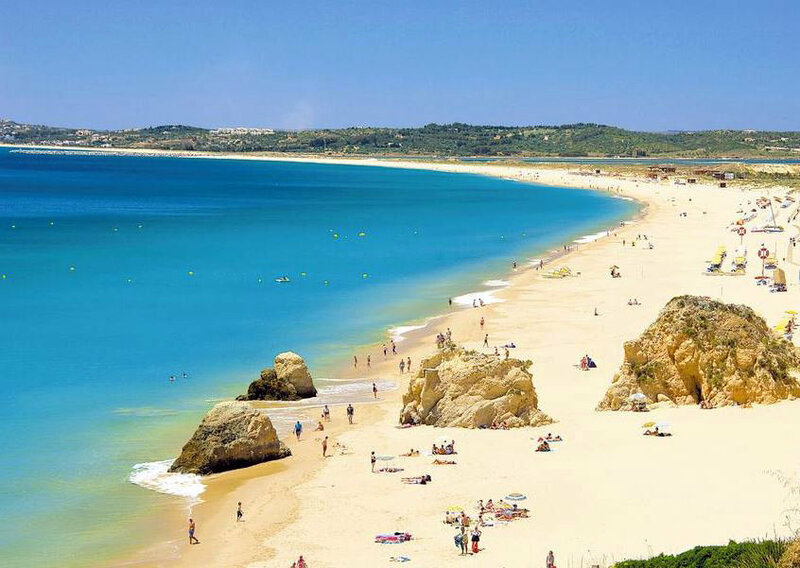 Praia de Alvor is quite a sandy beach, composed of fine white sand. Walking here feels great on the feet. 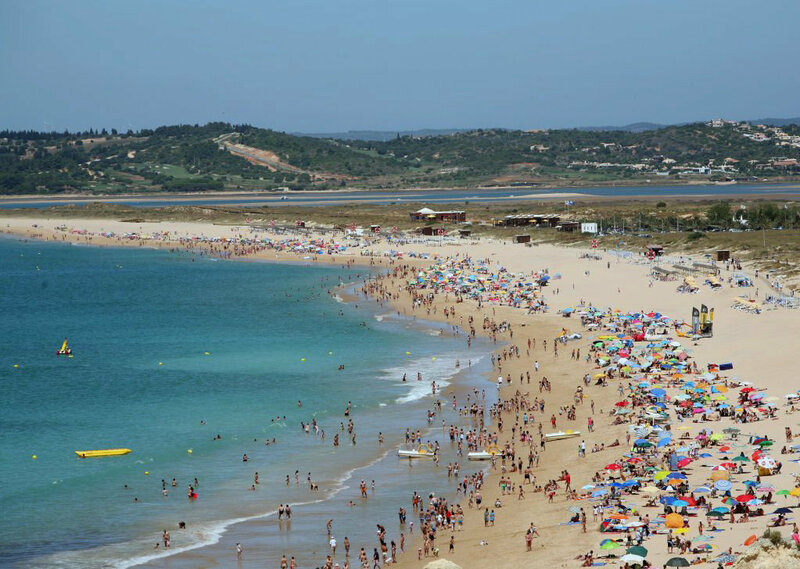 Praia de Alvor is also a big and open beach, stretching for several kilometres. The water is clean and has a transparent colour. However, the water of the Atlantic Ocean can be very cold in this area. Even so, it can be refreshing to swim here on a hot summer day. Beware that the current on this beach can be strong. Be careful in the water when you are visiting with small children. Also watch out on the eastern end of the beach, since there are some big rocks in the water. It is best to avoid swimming near the rocks. There are no rocks in the water on the western side and in the middle section. The beach can be crowded, especially during the summer months. However, there is always enough space for everyone. Also, the people are not evenly distributed on the beach. The beach has both crowded and quiet areas. The most crowded part is the middle section. The more east or west you go from there, the less crowded it will get. If you prefer to have more privacy on the beach, avoid the middle section. The beach attracts all kinds of visitors, including families with children. 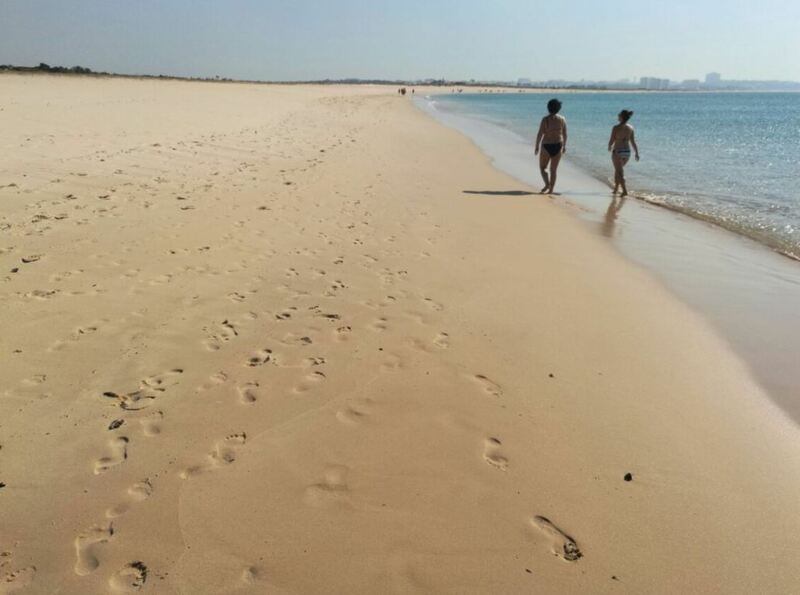 The sandy beach is quite popular with kids to build sandcastles and to play in the sand. On the western end, Praia de Alvor ends at the estuary of the Alvor river. You can see Meia Praia and Lagos on the other side of the estuary. On the eastern end, the beach ends with cliffs. 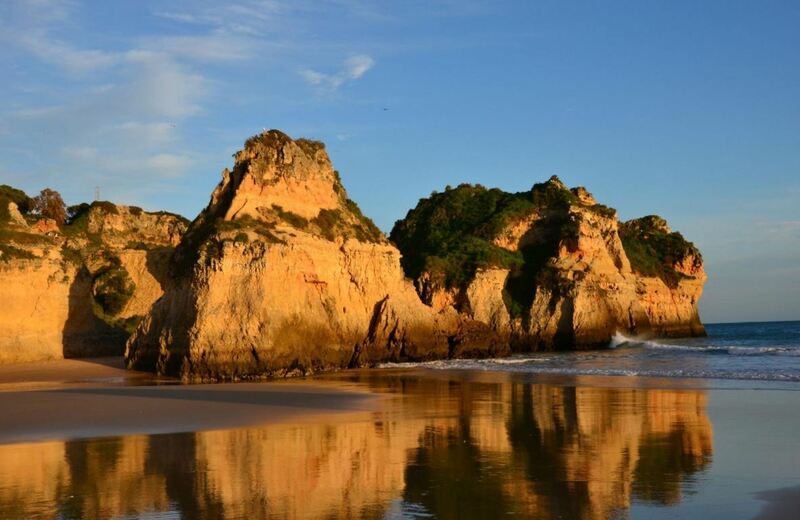 You will find Praia dos Três Irmãos on the other side of these cliffs. 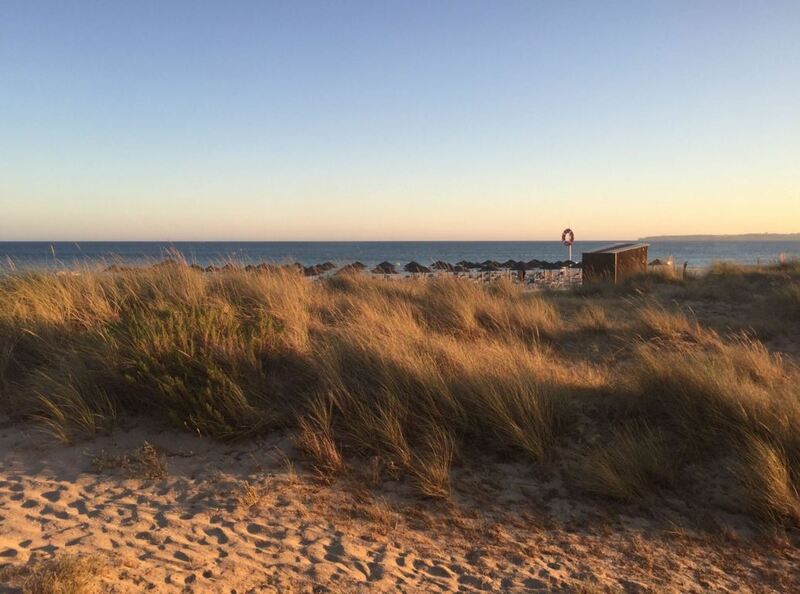 The beach is backed by dunes and the Ria de Alvor Nature Reserve. This makes it a perfect beach for lovers of nature. Behind the beach there is a lagoon, which is formed by the river of Alvor. This area is great for water sports, including kitesurfing, windsurfing, jet skiing and kayaking. There is a boardwalk over the dunes behind the beach, called the Alvor boardwalk. 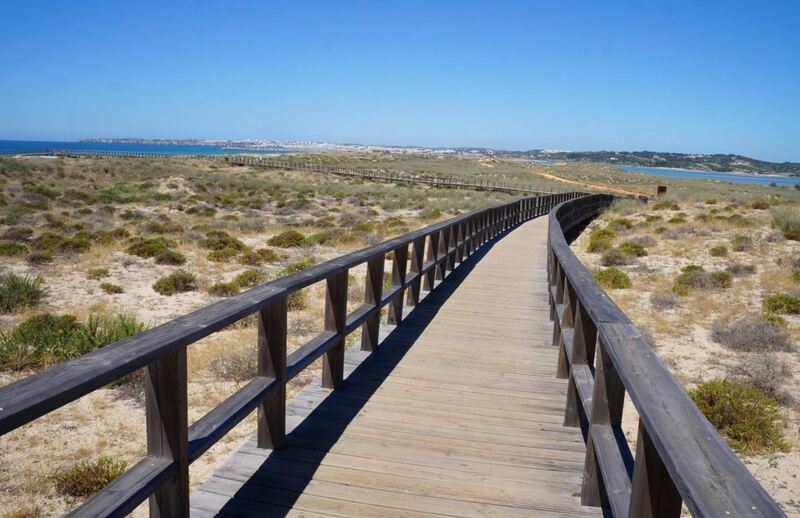 This boardwalk is about 3 kilometres in length and takes you through the Ria de Alvor Nature Reserve. It is great to walk here and enjoy the peaceful nature. Also it is possible to cycle over the boardwalk. The boardwalk is well maintained and also accessible by wheelchair. You will be able to see different kinds of birds along the way. 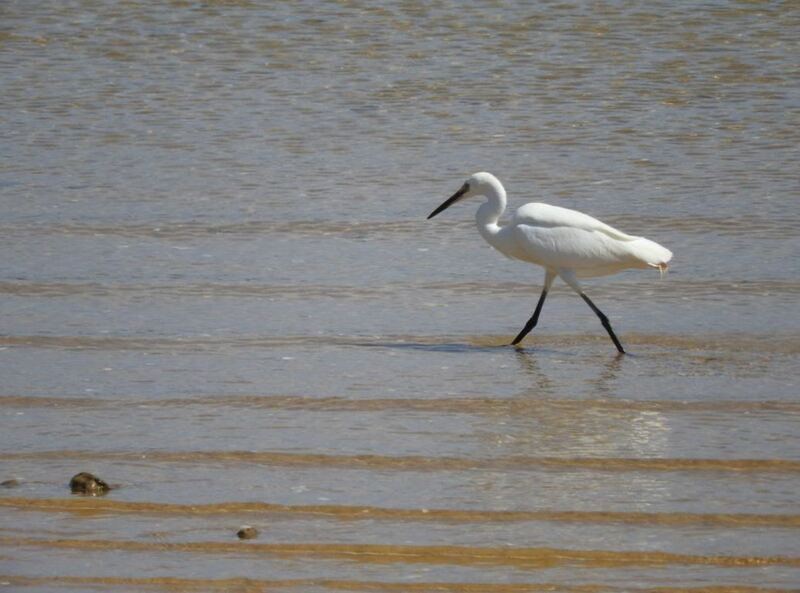 The Ria de Alvor Nature Reserve is great for birdwatching. There are several viewpoints on the boardwalk, providing beautiful sights over the river, the estuary and the surrounding area. If you are hungry or thirsty along the way, there are several bars and restaurants nearby. You can walk all the way to a small green/white lighthouse, at the end of the boardwalk. This offers you a great view of Alvor and Lagos. The size of Praia de Alvor makes the beach perfect for long beach walks. During low tide, you can also see people collecting shells. Walking on this beach can be a very peaceful activity. If you have the time and opportunity, make sure to explore the surroundings. In the direction of Praia dos Três Irmão and Praia de João de Arens, there are some breathtaking views from the cliffs up above. 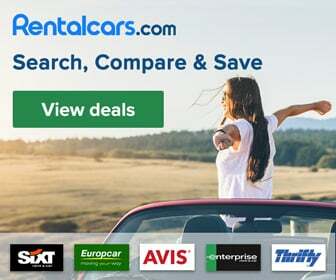 Travelling to the Algarve this year? Dont’ forget to bring the Marco Polo Travel Guide. 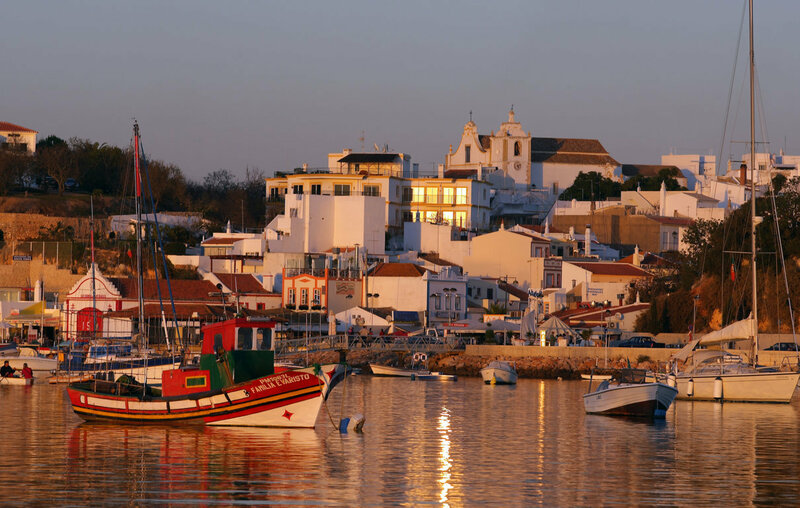 Alvor is a traditional fishing village near the Alvor river. It is not far from Portimão. The village is very lively, especially in the summer. When visiting the town, make sure to check out the local church, as well as the castle of Alvor. The town of Alvor has two beaches: Praia de Alvor and Praia dos Três Irmãos. They are actually one huge stretch of sand, extending for over 3,5 kilometres, and separated by rocks. Praia de Alvor is located on the western side of Alvor, while Praia dos Três Irmãos is located on the eastern side. 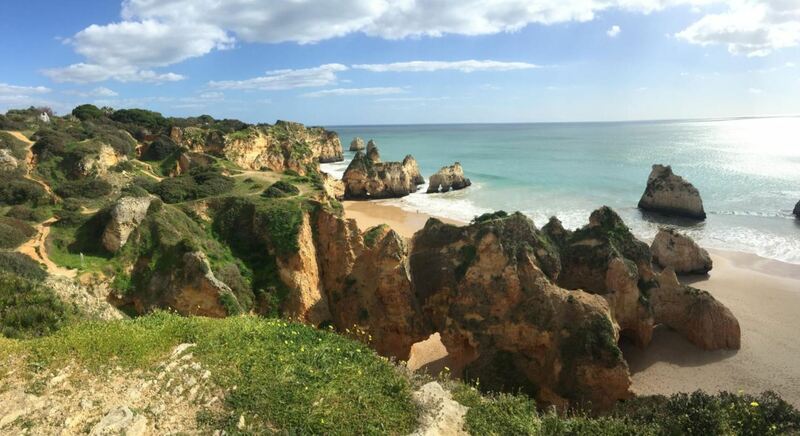 The beaches stretch from the estuary of the Alvor river in the western end all the way to the cliffs of Prainha on the eastern end. 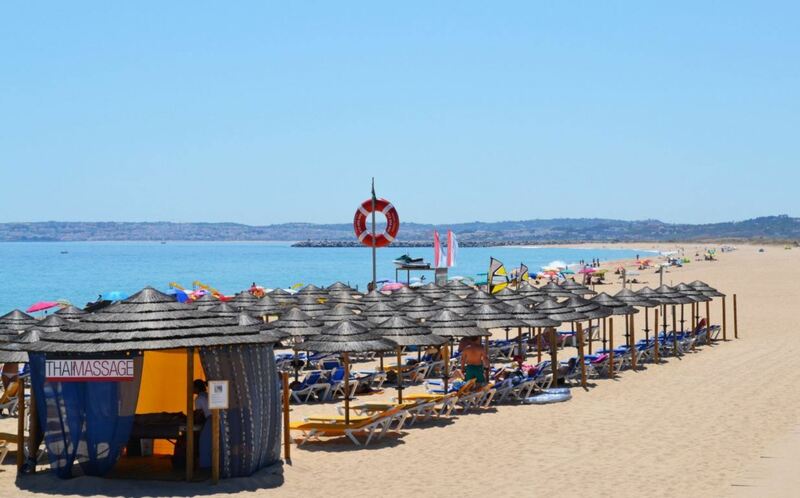 When going to one of these beaches, make sure you visit the village of Alvor as well. If you come by car, go to the town of Alvor. From there, follow the signs to the beach. There is plenty of parking space behind the beach or near the fishing port of Alvor. Parking is paid (€ 1,50 for a day) if you want to park very close to the beach. A bit further away, parking is free. There are several buses from Lagos and Portimão to the village of Alvor. From there, you can walk to the beach. 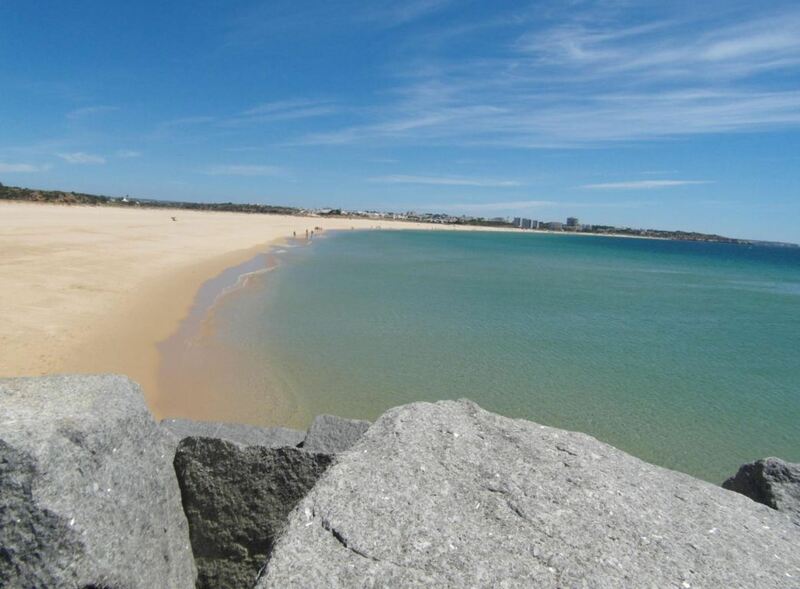 If you are in the village of Alvor, the beach is within walking distance from the town center. Since the beach is quite big, there are several access points to the beach. Dunas Beach Restaurant. The food is good, but slightly expensive. Excellent location though. 5 Quinas. Situated only two minutes from the beach, this is a great place to have lunch. Restinga Ria. This restaurant has excellent food, with a great view over the beach. 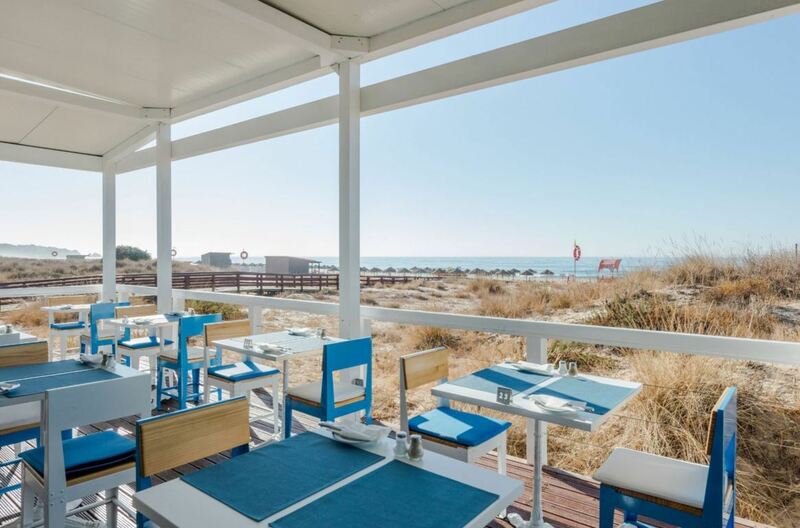 In the town of Alvor you can find many more restaurants. Pestana D. João II Beach & Golf Resort. 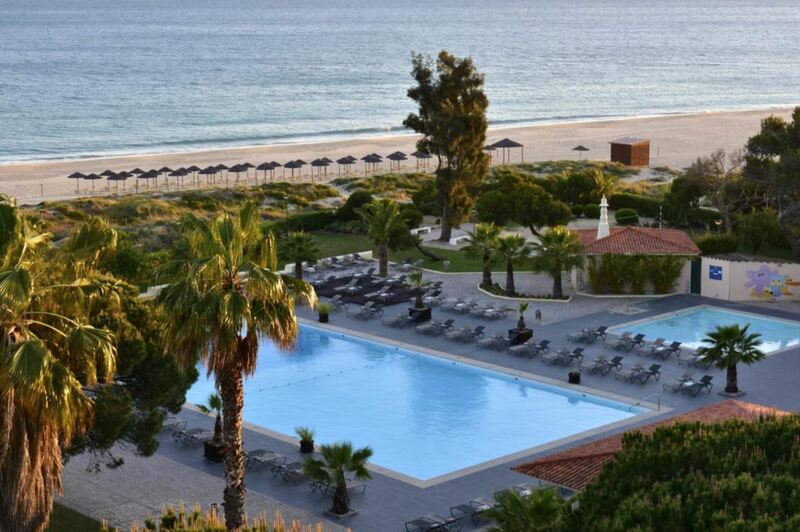 This 4 star hotel is very close to Praia de Alvor and offers several swimming pools and a green garden. The buffet restaurant of the hotel serves Portuguese and international meals. Apartamento Praia do Alvor. This highly rated apartment has everything you need and allows you to cook your own meals. Great value for money. Luna Alvor Bay. 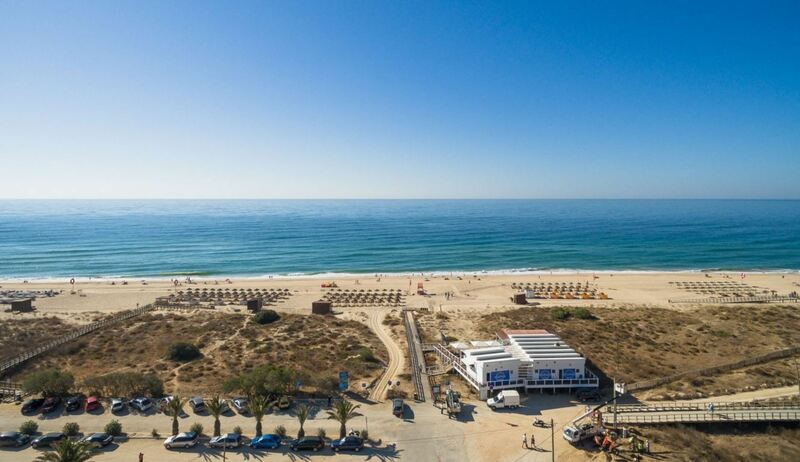 This aparthotel is located in between Praia de Alvor and the town center. Great for couples and highly rated. After the busy summer season of last year, we recommend to book your hotel now, as it will probably sell out. Below you can find a map with the location of hotels in Alvor. By changing the date of your holiday, the map will show you the current prices. 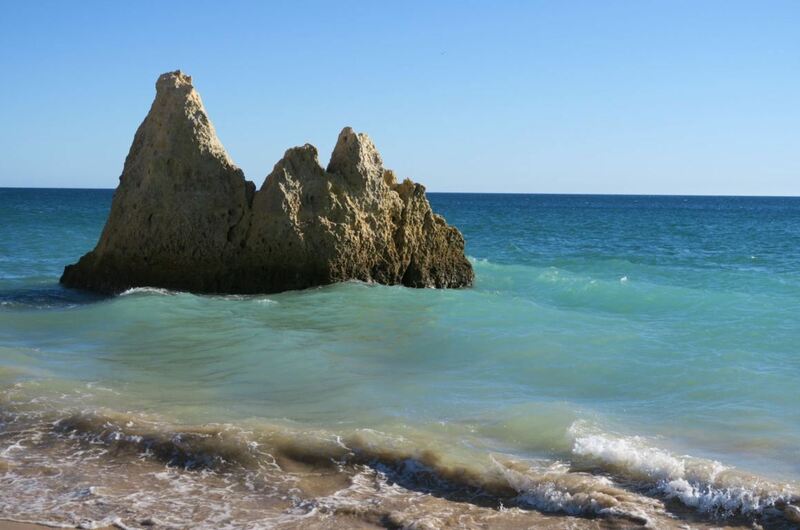 If you are in Alvor, make sure to visit other parts of the Algarve as well. For example, Portimão and Lagos are great cities that are located nearby. Or you can go to Silves and discover its medieval castle. Another option is to see the coastline of the Algarve by boat, which is absolutely spectacular. Below you can see our favourite excursions in the area. 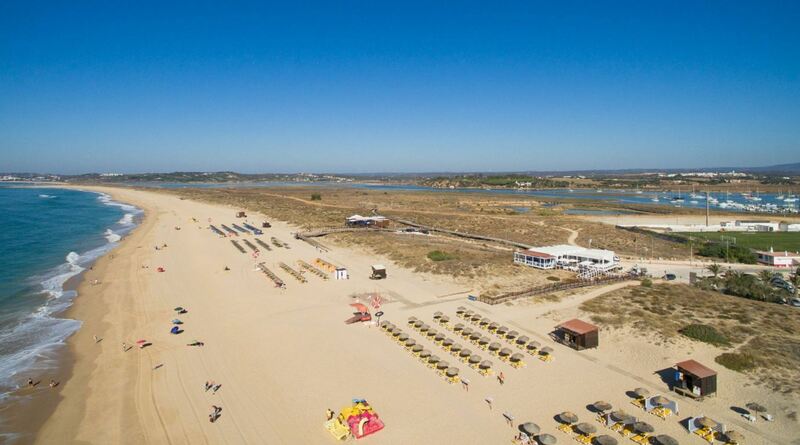 There are many facilities available on Praia de Alvor, especially in the middle of the beach. There are also several shipwrecks underneath the water. This makes Praia de Alvor popular among divers. The beach is also accessible by wheelchair. Getting around the beach by wheelchair is also relatively easy, since the beach is quite flat. There are lifeguards overlooking the beach and sun loungers for hire. An umbrella with two chairs costs about 15 euros for a full day. Summer is coming: what to do in the Algarve? Portugal safest country to travel to in 2018!